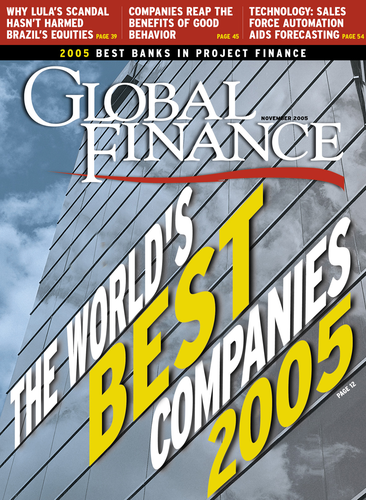 In this month’s issue we once again identify the world’s best companies. Increasingly, many of those companies have more in common than simply turning in great financial results and providing innovative and effective products and services. More and more, they are focusing their attention on the impact they are having on the communities in which they operate. Whether this is a consequence of being among the world’s best companies or is a contributing factor to their success, the moral is the same: Acting responsibly pays off in the long term. It is more than two years now since we first covered corporate social responsibility (CSR) in depth. Back then it was only the faithful few who were prepared to predict that CSR would become a key profit driver for global corporations. Now, as we find out in our feature on socially responsible investing, the word is out that not only are companies benefitting from increased interest from investors, they also are finding that focusing on their social and environmental impact is a highly effective risk management tool. As those same companies continue to benefit from their efforts to tread lightly through the world, we can only hope that their less conscientious peers and competitors will take note—and, hopefully, hop on the bandwagon.